Hey! When I first saw these polishes I didn’t want to get any. The colors didn’t really stand out in a way that made me want them. I did eventually cave because there was a $1 off coupon on it! XD They sure know how to make a sucker out of me. 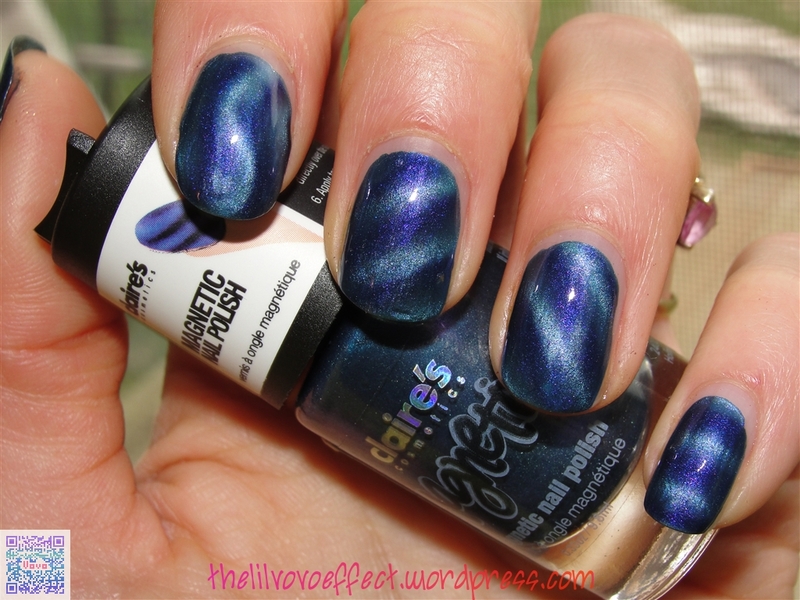 Polar Purple is of course one thin coat dried then followed by 1 thicker coat. No top coat for this pic. 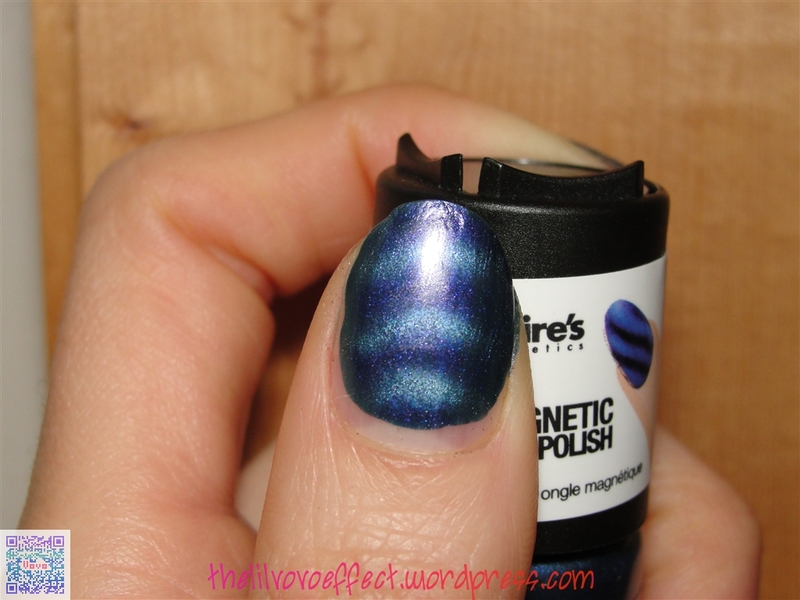 I find that you can’t take the directions too literally if you do a THICK coat the magnet will pull the polish up! I THINK that also have curved nails beds like mine might be a factor in that, seeing as the magnets are flat and not curved. My index finger is the one that pulled and that’s my most curved nail. I think these turned out really good and can’t wait to try my other magnets out with this one and also will feature a neat trick I learned from another nail blogger later. The following picture is with top coat, which cause some of the lighter lines to streak downward. I didn’t wait 10 min. as some have recommended. 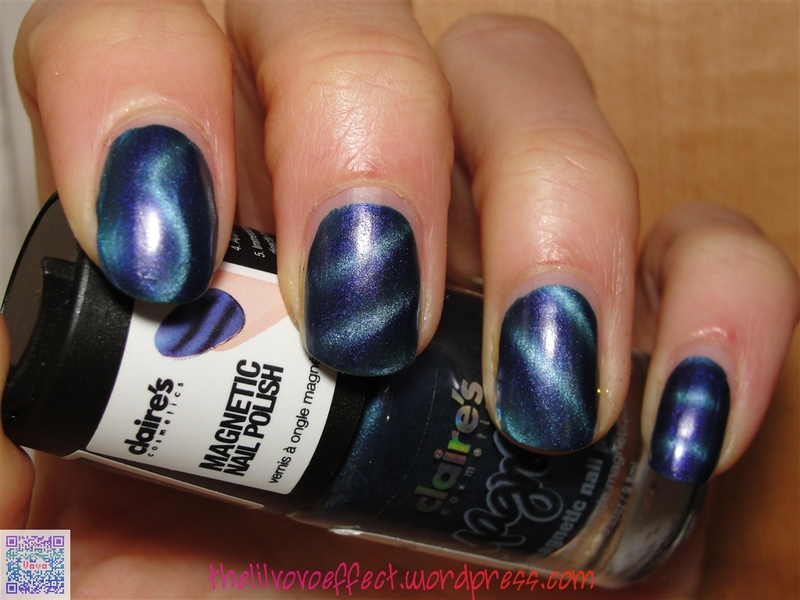 So some of you that read this this is my second Claire’s Magnetix polish. They don’t have any real names so I call ’em like I see ’em. So here’s the blue all my thoughts are the same as “gold’s” post. Except I think the darker color helps with the coverage. Or maybe because this is my 4th time applying it and I’m getting a little better at it? The only thing that would be different about what I said in the previous post about the polish is that this blue is very pretty! I was afraid my camera wouldn’t pick up the beautiful purple shimmer in it. Also, if you look at the pinky finger I did the magnet “on point” instead of with the guide…so I basically just put the point where to two edges met on my cuticle. 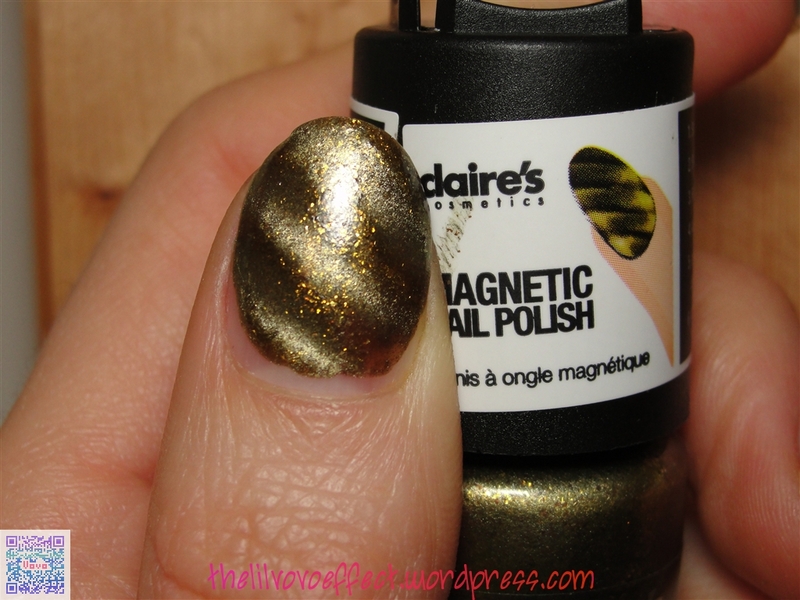 So the no name “gold” magnetix polish comes with the removable cap that the magnet is straight diagonal lines . 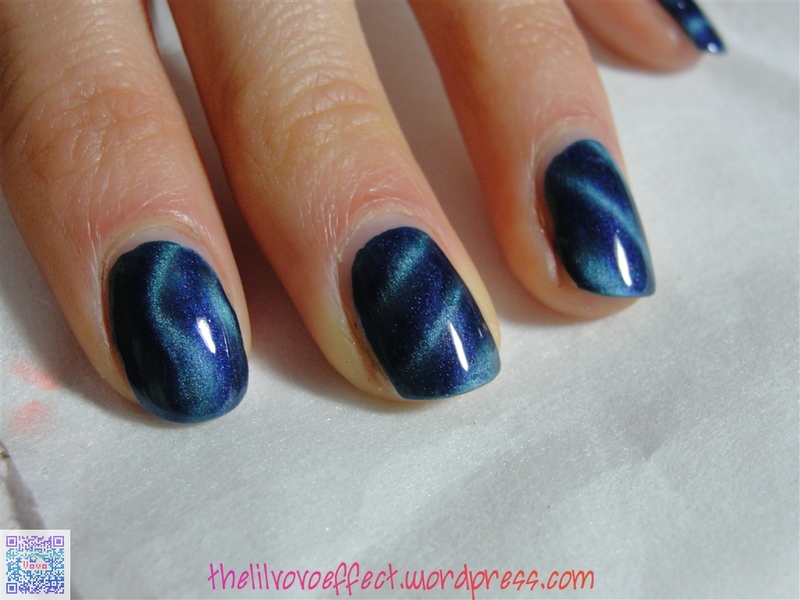 I also have the blue polish and it has the wavy magnet that I also used on this polish. If you look at the last picture it shows the guides on the cap for where you place the magnet over the nail. The guide goes on your cuticle and you hold it just over the wet polish. Scrangie has a great FAQ & Troubleshooting on the subject. This is my first magnetic so I’m still learning. Even with all the information there is on the subject you still have to practice to get it. You can see in the first picture a little bit of balding. There are a few spots that looked smudge, that’s because the polish was too thick and the magnet pulled it up off the nail. I think I had some balding because I didn’t go thick enough because I was afraid of it pulling it up again. Again, I say practice. Other then the weird shaped mop like brushes the formula was good a little thick but not gloppy. Goes on nice and smooth. I love how this gold reminds me of tiger eye rocks, sort of glass flecked too. Later you’ll see the blue and I will also show these without a magnet in the future.